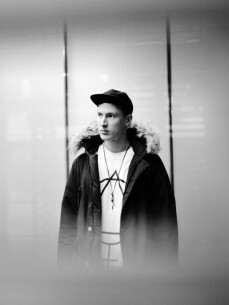 London based producer Stray made his first mark on the drum & bass scene back in 2009. Known predominantly for a more stripped back sound, he's since shown an ability to work within a remarkable variety of styles whilst keeping a distinctive quality to his music. The wide range of influential labels who have released Stray's music over the past few years reflects the diversity of his output - be it the sparse keys of his Exit Records debut 'Pushed' or the relentless dancefloor jungle workout of the recently released 'Ginseng Smash' on Critical Music. A comparatively modest catalogue of releases and DJ mixes displays Stray's considered approach to his involvement in the scene - his ethos of quality over quantity apparent since his very first release on the esteemed Critical Music imprint. The first collaborations with Sabre and Halogenix were a natural progression due to the trio's shared interest not only in each other's works but also in a specific and considered production ethos and sonic goal. With the initial sessions sparking the well-received tracks 'Askari', 'St.Clair' and'Oblique', the three went on to form Ivy Lab and have been busy in the studio together ever since. Their first full EP, entitled 'Missing Persons' was released on Critical Music in 2014. Stray is also continuing to work on his own solo output, with his 'Matchsticks' EP and the 'Chatterbox' EP both having been released recently on Exit Records. Both records showcase the producer's ability to slow things down and write at different tempos whilst retaining his signature sound. With this new material gaining support from the likes of Annie Mac, Gilles Peterson, Mark Pritchard, DJ Friction, Rockwell, Machinedrum and Om Unit, it's clear that Stray's music is beginning to appeal more and more to the wider electronic music scene.